Abies × shastensis, first described in 1897 by John Gill Lemmon (1832–1908), is commonly known as Shasta Red fir. It is a natural hybrid of A. procera and A. magnifica where the two species intergrade in southern Oregon and northern California. Up until recently this hybrid had been classified as a variety of Abies magnifica, A. magnifica var. shastensis. Recognition of the hybrid origin of this taxon was long disputed, but with the morphological evidence compiled by Tang-Shui Liu (A Monograph of the Genus Abies ©1971) and the monoterpene evidence of E. Zavarin et al. (Geographic Differentiation of Monoterpenes from Abies procera and Abies magnifica ©1978) now supplemented by the analysis of chloroplast haplotypes by D.K. Oline (Geographic variation in chloroplast haplotypes in the California red fir-noble fir species complex and the status of Shasta red fir ©2008), there is no longer room for reasonable doubt. Description. 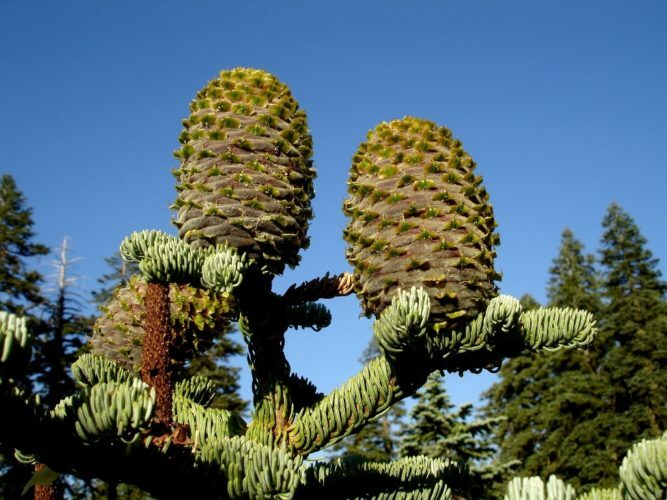 Trees display characters intermediate between the two species; the most conspicuous such character is a transition from exserted bracts (procera) to included bracts (magnifica) in the mature female cones. Distribution. This specific hybrid naturally occurs in the U.S. — southwestern Oregon, and in northern California (Shasta, Siskiyou, and Trinity counties).